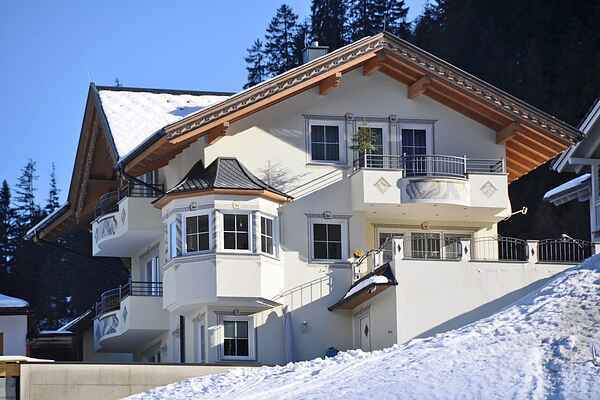 This new and luxurious apartment is located in a beautiful and quiet setting right at the ski slopes and slightly above the lake in the Paznauntal valley. The apartment has new and comfortable furnishings, both bedrooms feature an en-suite bathroom and the eat-in kitchen is perfect for cooking and enjoying a meal with friends and family. All rooms have been furnished in a modern style and come equipped with everything you'll need. There's also a lovely terrace with a sunbathing lawn and garden furniture, and you'll have a terrific view of the surrounding mountains and the ski run. The apartment's location allows you to ski right up to the slope and on to the valley station of the Medrigjochbahn. In the summer, the Silvretta All-Inclusive Card gives you access to all the cable railways and chairlifts in Ischgl, Galtür, Kappl, See and Samnaun - no restrictions, every day, as often as you like. Free entry to the outdoor and indoor swimming pools in Ischgl & Galtür and the adventure water park in See! You can take the popular, toll-free Silvretta High Alpine Road and enjoy a panoramic tour with your own car, motorcycle or by bus.